We have the most amazing couples ever! Frobaby Productions is the DJ company to work with for awesome talent, amazing setups, and amazing energy! Read our reviews and watch our videos. 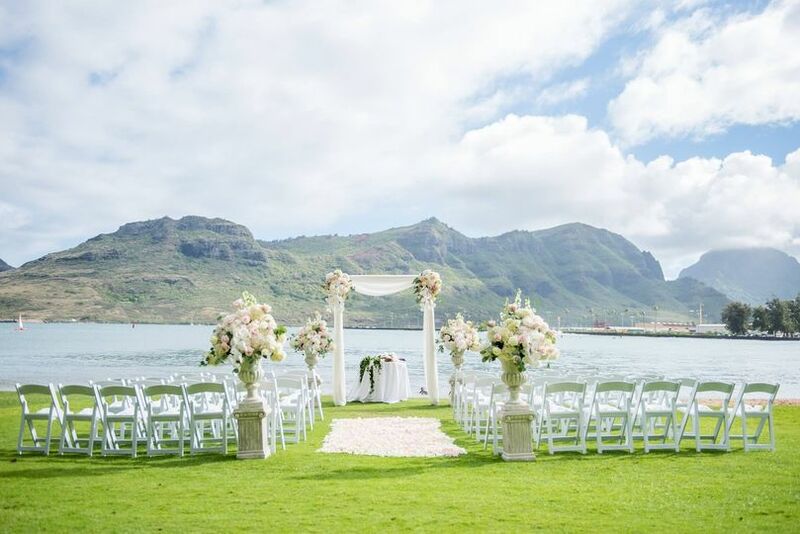 Our goal is simple: make your wedding the most amazing wedding that your guests have ever attended. Period. 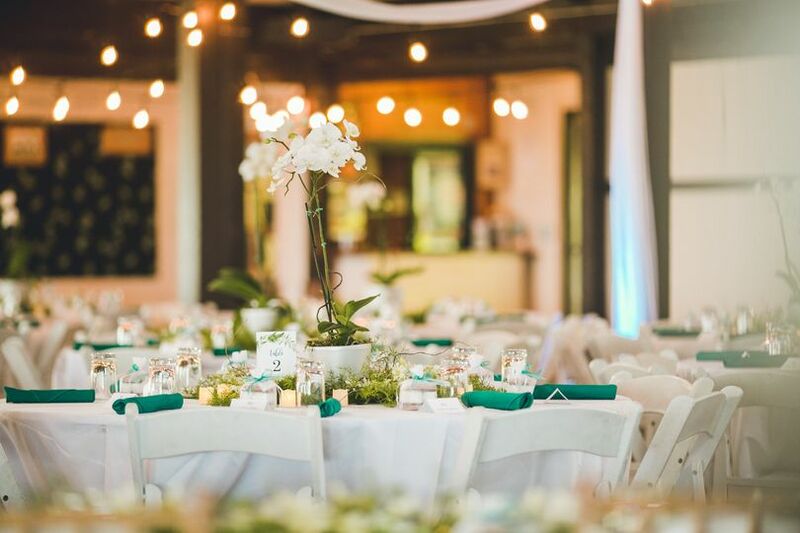 We keep the attention on the guests of honor and fuel the energy of the reception from the inside out through classy and effective use of intelligent lighting, music, and preparation. 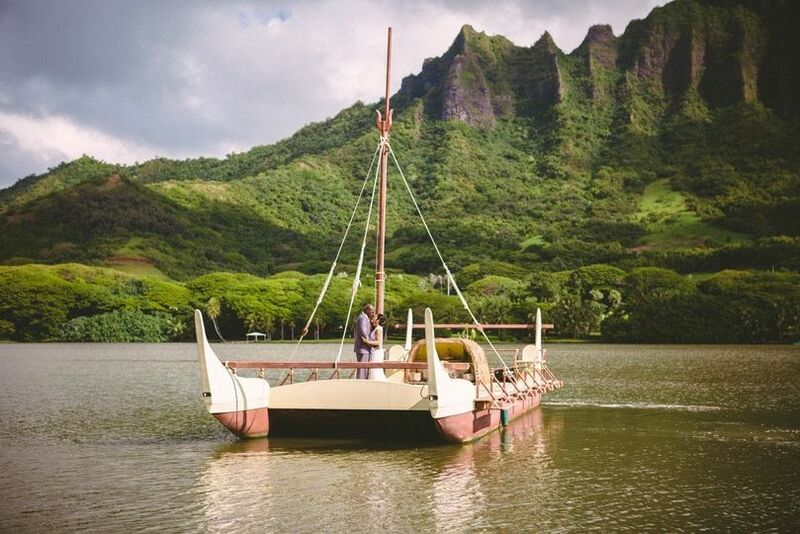 The bride and groom are the VIP guests and everything we do is to make their day amazing! 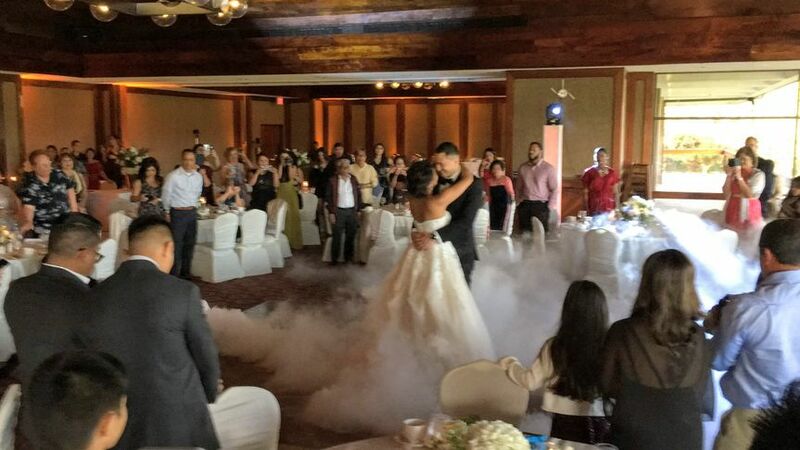 We don't overwhelm the venue with complex special effects or over-the-top MC work. We complement the venue and add energy and elegance to the space. We make use of uplighting, elegant DJ booth setups, illumiated towers with intelligent lighting, spotlights, the perfect music, and more. 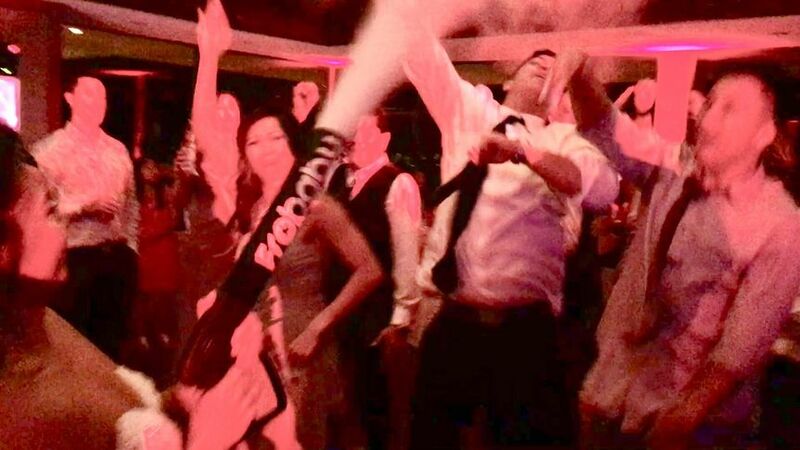 We can also do rockem' sockem' things such a "dancing on a cloud" and arming our amazing bride with our CO2 cannon during the dance party!!! The couples we work with are AWESOME! We love our clients and would love to work with you. One of our strengths is being able to build a connection with your guests through music and presence. We realize that the DJ booth is often a secondary focal point of a reception. Our DJs and MCs do not steal the show. The vibe and energy that comes from the booth area can have a huge positive influence on the room, even when nothing is said. 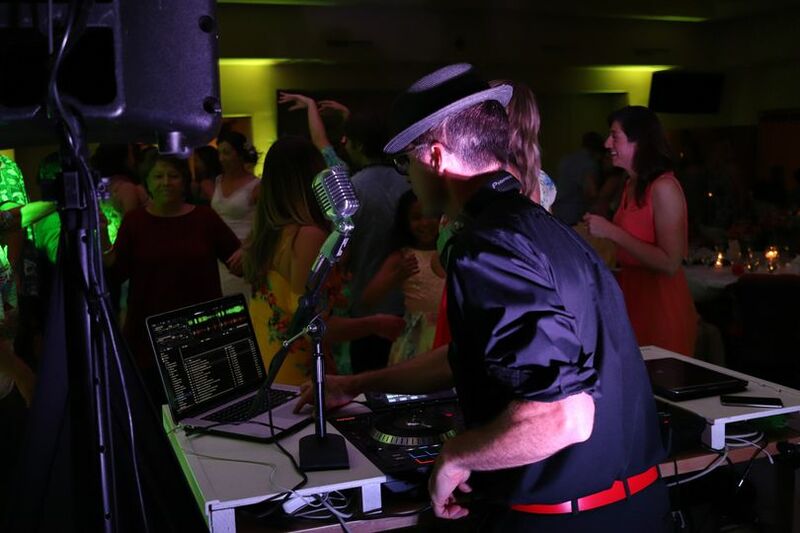 Our DJs connect with your guests through music. We know we're doing an awesome job during dinner and cocktail hour when seated guests give "thumbs-up" to the DJ booth or come over and let us know how much they love the music. 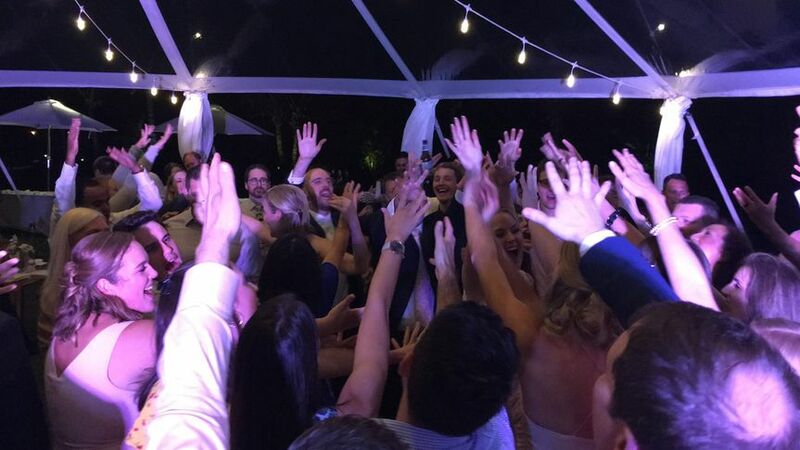 During dance not only do we get high-fives from the dance floor, but when we see hand go up in the air, we know it's rocking out there!!! Our upscale DJ booth setups are "open" to plain view of the guests. We never just put "stuff on a table." 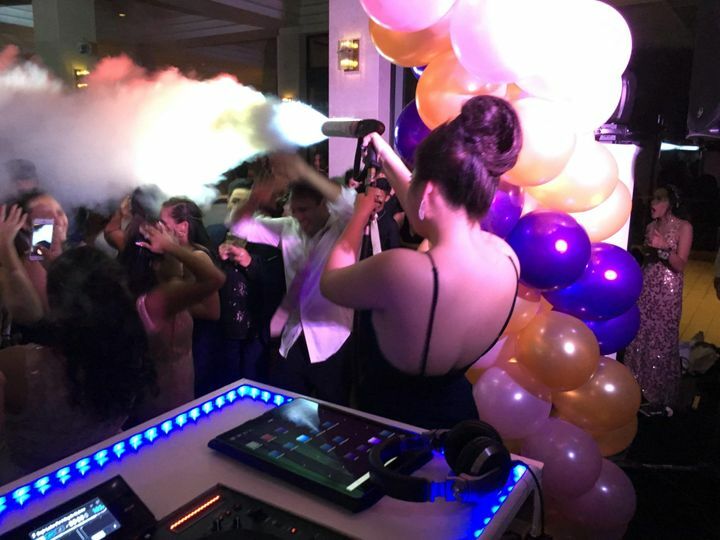 We have custom built DJ booths that look amazing and allow your guests to see the DJ mixing music and rocking the party with their own eyes. 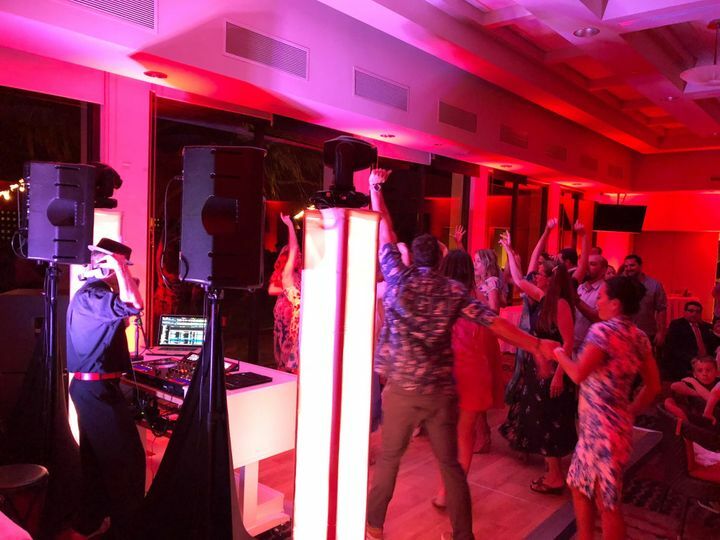 We try to position the DJ booth as close to the edge of the dance floor as possible to create that connection with your guests so they can see the records spinning. 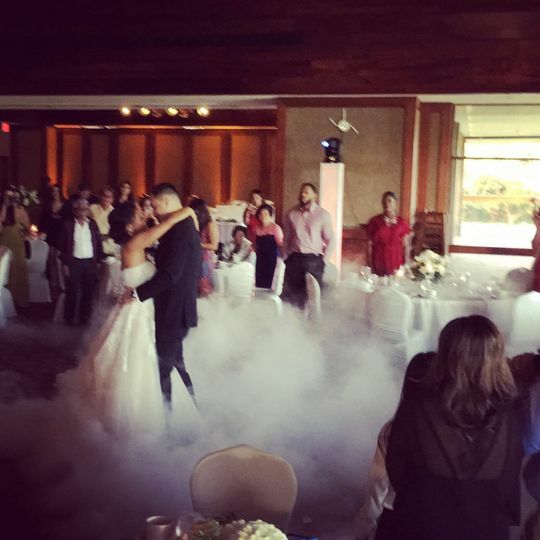 To us, your guests are VIPs at an exclusive, invite-only, VIP dance party with a live DJ!!! 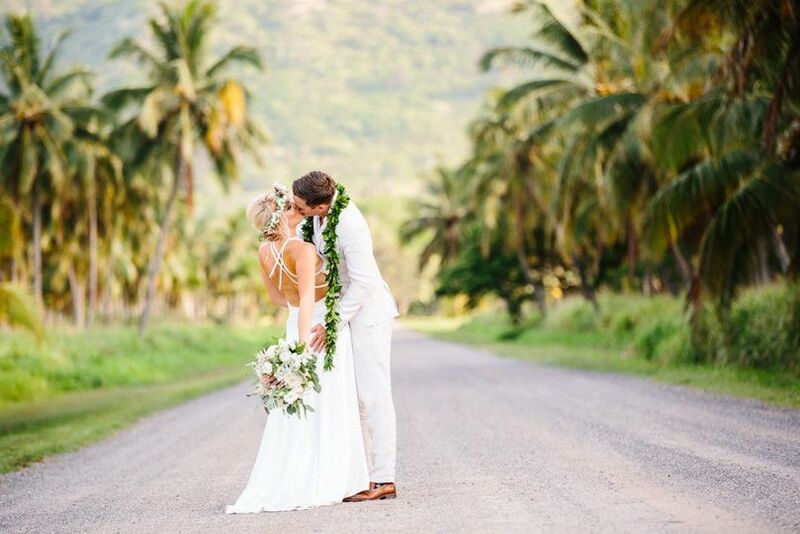 We love destination weddings! They are our specialty. We make it easy to plan remotely by giving our clients access to our online playlist and timeline builder, and also allowing clients to review and approve contracts online, and make payments online. We communicate with our clients through email, text, phone, messenger, WhatsApp, or whatever is most convenient for them. Then, if possible, we meet up in person a few days before the wedding. Whether guests are coming from California, New York, Australia, Korea, Japan, or Mexico, we thrive on creating a blend of music and vibe that will bring everyone together. We also enjoy local weddings! 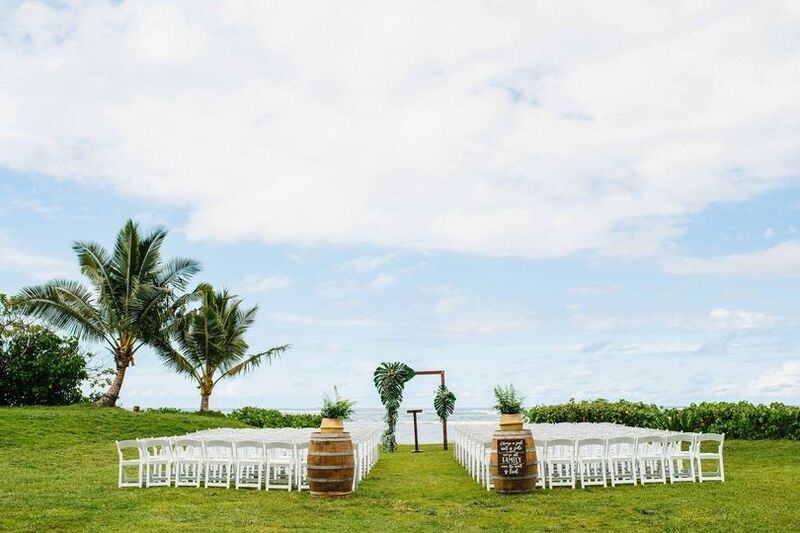 Whether your guests are all locally from Hawaii or are flying in from the mainland or overseas, we will will work with you on planning the music and vibe that will make for the greatest wedding ever! Since we are also here locally, we can meet up in person or communicate by phone, email, etc. We create fully custom music pools for all of our clients. We do not recyle "standard play lists." 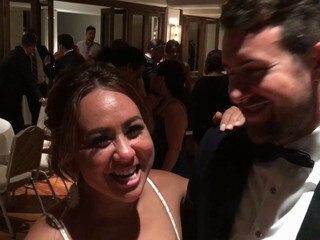 We work with each client on the music for the ceremony, cocktail hour, dinner, and dancing. For example, if most of your guests are coming from the Bay Area of California, the approach to music is going to be slightly different than if they are coming from New York City. If you have guests coming from all parts of the globe, we will create the perfect balance to connect all of your guests through music. We do offer MC work. Most of our clients choose to have our DJ do "light MC" work, which includes grand entrance and any other annoucements that need to be made. Our MCs and DJs do not steal the show.They are professional, classy, subtle and energetic. Booth and uplights color sync. Luxe Booth w/ flower accents. Dry ice haze at dance time. Two words... CO2 CANNON! If you don't know...hire him and you'll find out ;) Nate was absolutely amazing! Such a genuine, life loving guy who knows how to get the party started and KEEP the party going! I met with him, along with my (now) husband and wedding coordinator the day before the wedding. He was very professional, and listened to our wants for our song selections and music choices, and even made suggestions to spice things up a bit! The night was such a memorable experience partly because of Nate. 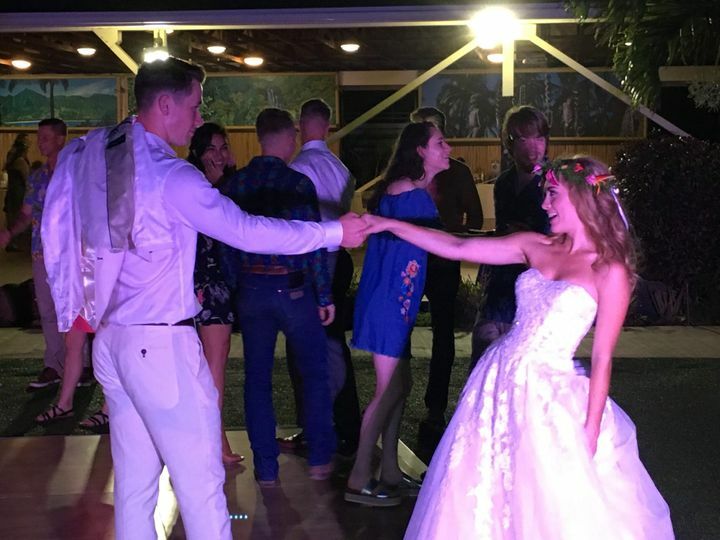 I cannot tell you how many compliments I received on how fun my wedding was! There was never a moment where the dance floor was empty. Thank you so much for everything, Nate! 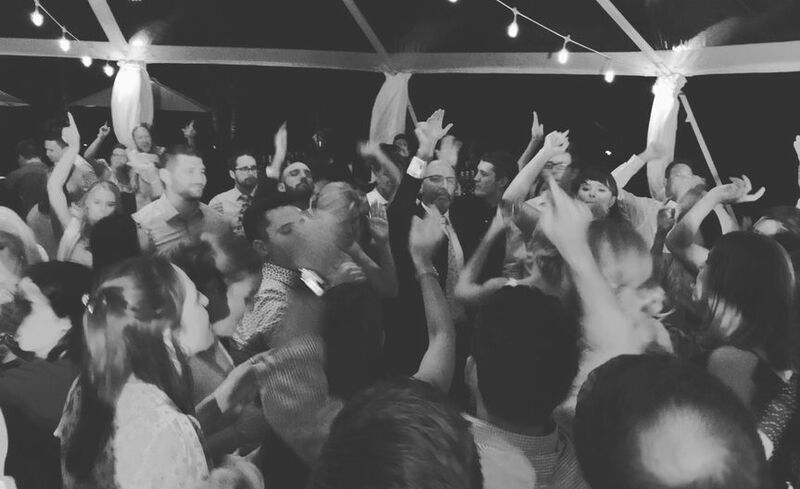 Simply put, DJ Nate made our wedding reception!! He was exactly what we wanted and played everything we asked for. His website is easy to use and navigate, especially for music requests. He was worth every penny and would highly recommend him to anyone. Thank you for a wonderful time. Thank you for keeping the party going up in Late, Hawaii! We hired DJ Nate and sent him a list of songs. However, a few family members went rogue and asked for a few classic Aussie songs. He managed to find those songs, kept the party going the whole night and everyone was always on the dance floor. He set the mood, the tone and was a wonderful MC. Our wedding went off without a hitch and he worked so well with all my other vendors. I highly highly recommend Nate. We planned this from far away and never actually met him in person until the day of and felt like we knew him for ages. 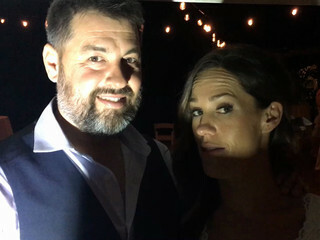 He also provides uplighting which gave our venue that extra touch. You won’t regret hiring Nate and worth every penny.